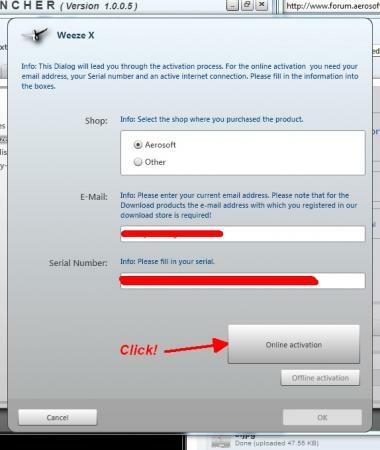 We have seen that after Windows 7 Service Pack 1 is installed some of our product can be seen as not activated. Bit of surprise as we did not see any of these problems with the beta's of Service Pack 1. But we got the fix ready, just a 6 mouse clicks and all is solved. 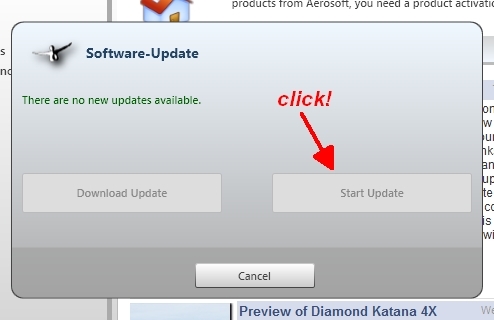 .... and start the update. This will close the launcher and start the installer. ....if so, just click one more time. All done. Of course the activation counts have all been reset so you will not loose any activations (not that we make an issue about that btw, if you run out just contact us and we'll solve it). Thats why I love Aerosoft so much! I do not have the 'Check for Launcher-Updates' option showing in my help menu? After updating to W7 sp1 last night I have just gone through the process describe here but after the launcher finds update 1.0.0.5 - I download and install but now every time I start the launcher (to try and re activate Barcelona X) launcher version 1.0.0.2 starts and advises I have 1.0.0.5 in my system do I want to update, I click yes, but same happens on restarting the launcher. I'm stuck in a loop. Any Ideas? After a couple of system restarts the launcher is now finding version 1.0.0.5 Please ingnore the above. 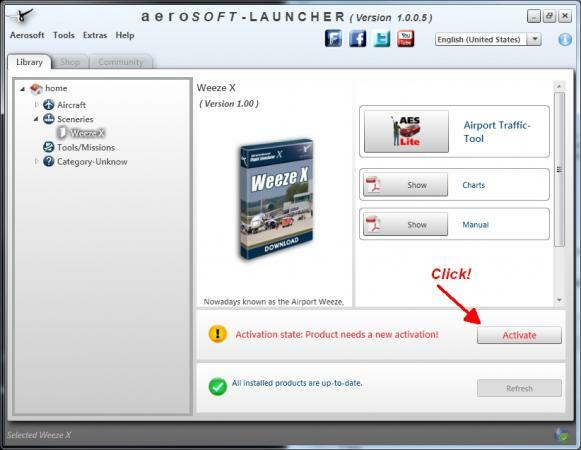 You get the aerosoft launcher if you purchased one of the following: Huey X, Weeze X, Dangerous Airports 1, Stuttgart X (theres more but I cant remember them all). 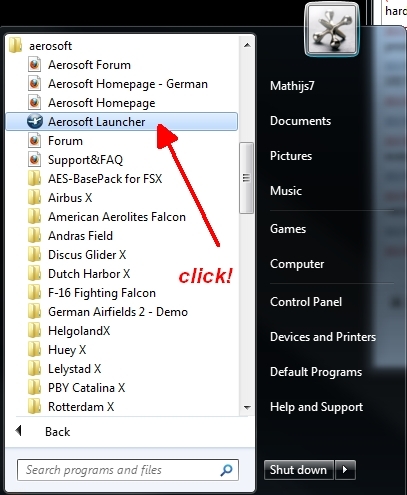 If you dont own these then theres no need for the aerosoft launcher. so I don't need it for older products? Today I posted a message on the Mega Sceneries Forum about Barcelona in FS9 missing. Is the up-date to the Launcher info as mentioned above still needed as I got version 1.0.0.2 when I opened it today. The Barcelona is in Airports and all my other in unknown. The scenery has worked as it was installed in March before the Windows Sp1. 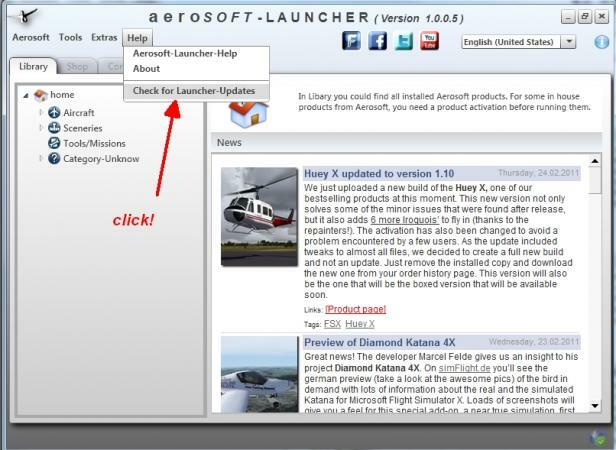 You can get the latest launcher from here. Older products that dont use the launcher may be categorised as unknown. I'm on the latest version of the launcher as it insists on re-installing even if I have it and it re-sets my previously activated products. Personally, now I don't bother with it. Hopefully, it will be sorted soon. I have the Aerosoft Launcher version 1.1.0.0. Think this is the last one. The problem is that when I am going to "Help - Check for Launcher Updates" the program crashes. 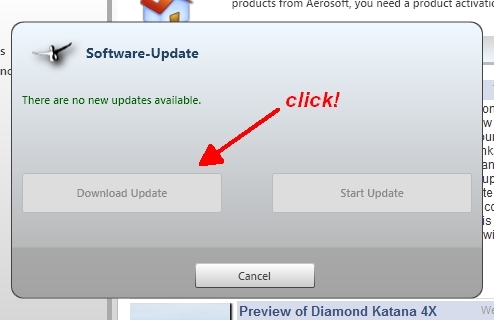 I have the Aerosoft - F-16 in the Aircraft list, but the "Activation state: Activation not required" and also I can only make product updates for the Corfu X.
I use Windows 7 Ultimate with SP1. we just fixed that bug ! Just download the 1.1.0.0 again ..., this ll fix it. The F-16 is correct listed with "Activation state: Activation not required" caus it dont need a launcher activation.